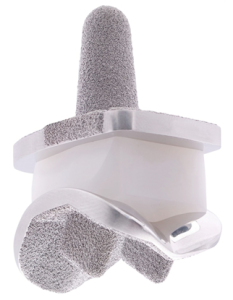 The Hintegra Ankle Replacements was developed in 2000 and has become a viable option for certain patients with end stage ankle arthritis. It is a more novel technique than knee and hip replacements but used in the right patient can have brilliant outcomes. The procedure aims to provide minimal bone loss of the normal ankle anatomy providing metal fixations and a high density polyurethane filler to function as your new ankle joint. The base of the tibia (shin bone) and the top of the talus (bone in the ankle) are prepared in a similar way to knee replacements and are carefully fitted with the specially designed prosthetics. The inside of the medial malleolus (inside ankle bone) is also prepared to allow normal function and small anatomical variants can also be altered at this point. 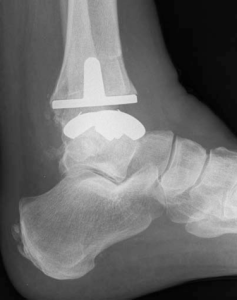 Although total ankle replacement is a brilliant option compared to fusing the ankle joint it is important for the surgeon to pick their patients carefully. Patients who are grossly unstable, have poor bone quality or have poor foot alignment (particularly varus or high arched feet) can have negative outcomes. Calcaneal osteotomies or cutting and shifting the heel bone can help in some of these cases but it is up to the surgeon’s expertise to determine whether or not this will suffice in certain patients. There has been small changes to the ankle replacement system over three generations and they have attempted to maximise wear and stability. The patient is put in a cast for the first 10 days and then soft casted for another four weeks in order to allow bone remodelling to occur and to ensure the prosthesis is stable. After 6 weeks the patient can partially weight bear in an aircast boot but will be asked to continue using your walker or crutches up to 12 weeks. Depending on recovery people will return to normal activity anywhere between 3 and 6 months.